After all those winter pork dishes, we needed something simple and vegan for tea. So I phoned Dan, my identical twin brother (yes really!) and he came up with this recipe. Both he and I went veggie at the same time - the difference is that he's still eating only veg, 36 years later. I lapsed after 15 years: and now butcher pigs! Veggie burgers can be soggy, but these are roasted in the oven and have crunch and texture. 1. Either grate the bettroot by hand, or if you have a food processor, use the fine grater . 2. chop the onion, garlic and apricots - either by hand or with the cutter blade in your food processor - the add in the drained beans and mash them all together. 3. combine all the ingredients in a large bowl, with the chopped veg and beans, and the grated beetroot. Leave for 10 mins in the fridge to firm up a bit. 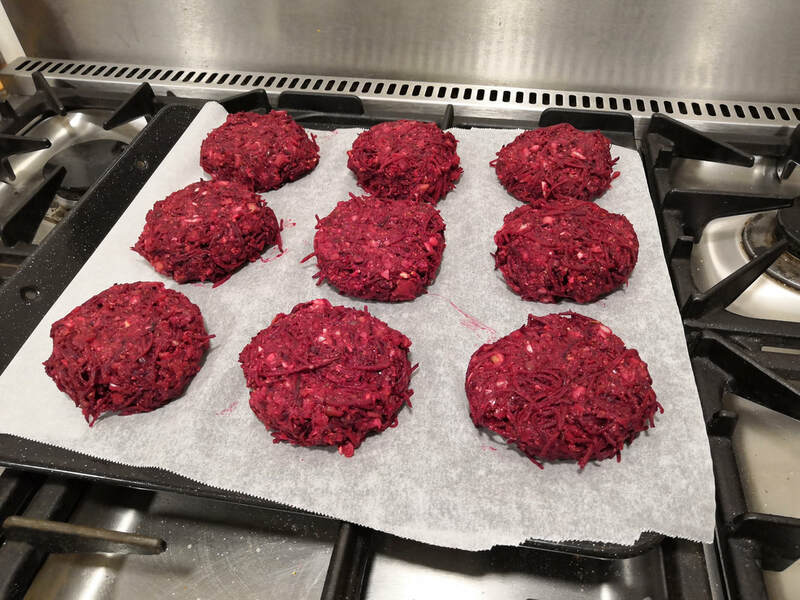 4. divide into 6 balls, and squeeze them into a large burger by pressing them down onto a large baking tray lined with baking parchment. 5. drizzle over a litlle sunflower oil and bake in a hot oven - 180C / Gas 5 for 30 to 40 minutes. Leave them in long enough to crisp up on the outside. We had ours served on a slice of homemade sourdough toast; a large blob of mayonnaise on top (oops, not vegan); and winter coleslaw, and dill picked cucumbers on the side.